Come to a Family Skate and Pizza Party! Come to a benefit Family Skate and Pizza Party before the snow completely goes! 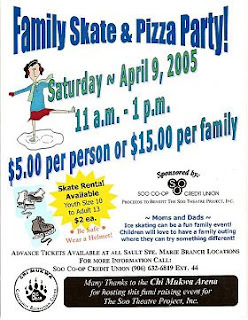 The party takes place on Saturday, April 9, 2005, from 11 a.m. to 1 p.m. at the Chi Mukwa Arena in Sault Ste. Marie. Admission is $5.00 per person or $15.00 per family. Skate rental is available at $2 per pair, in Youth Size 10 to Adult 13. Be Safe! Wear a Helmet! The party is sponsored by the Soo Co-op Credit Union. Proceeds are to benefit the Soo Theatre Project, Inc.
Advance tickets are available at all Sault Ste. Marie Branch locations. For more information, call the Soo Co-Op Credit Union at (906) 632-6819 Ext. 44. Many thanks to the Chi Mukwa Arena for hosting this fund-raising event for us! Don't miss this fun family event!